The arms of the House of Orléans of the ninth creation, surrounded by the Collars of the Order of Saint Michael and the Order of the Holy Spirit. 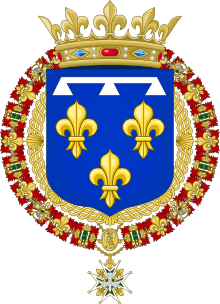 The third dukedom of Orléans was created by Francis I for his second son Henry at his birth. When Henry's elder brother and Dauphin, Francis, Duke of Brittany, died childless in 1536, Henry substituted him as Dauphin and ceded the title to his younger brother Charles, Duke of Angoulême, who died childless in 1545. ^ One or more of the preceding sentences incorporates text from a publication now in the public domain: Chisholm, Hugh, ed. (1911). "Orleans, Dukes of" . Encyclopædia Britannica. 20 (11th ed.). Cambridge University Press. p. 282. This page was last edited on 24 April 2019, at 17:14 (UTC).